Leviim Wraps Up Week One. H ello there family and friends of Leviim ‘17! Shavua tov, we hope you had as incredible of a week as we all did here at camp! To pick up where we left off on our last blog post, Thursday was our first full day of camp, and boy was it packed. We woke up and walked down to mifkad (flag raising), the girls definitely enjoyed their leisurely 50 foot stroll to the flag pole. We all enjoyed singing Happy Birthday to our madrich (counselor) Zoe! Everyday we have multiple options for t’fillah (prayer), including mechitza (gender separate), egalitarian and a brand new learners minyan. 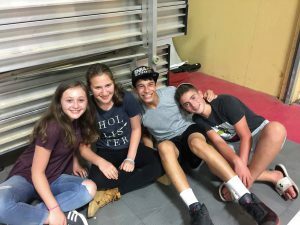 All of our chanichim (campers) have the opportunity to try out different prayer experiences and find what is most meaningful to them. After t’fillah we eat breakfast and jam out to everything from Israeli music to old Zimriyah songs. Then the chanichim go back to the tzrif (bunk) for an always much needed nikayon (bunk cleaning). The mornings are split into three peulot (sections); kita (class), schia (swim) and chuggim (electives). Some of the common elective choices for Leviim were; boating, cooking and the aerial silks. The afternoon was jam-packed with activities such as dodgeball, name games, yoga and Marcelo taught all the banot (girls) a new dance. Our peulot erev was a chinuchit (educational peulah), where we all learned the theme of the summer, “Al tikrei banaich, ella bonaich” (don’t call them your sons, rather your builders). The chanichim watched videos featuring different ethical dilemmas and determined who was a builder and who a son. Friday, the beginning of the Yavneh Shabbat experience, was kicked off with an Iyun T’filla where the banim and banot split off to discuss different aspects of prayer. The weather was perfect for afternoon games of kickball, football, basketball and newcomb. Unfortunately, as the evening wore on, the torrential downpour forced us to have Kabbalat Shabbat indoors. 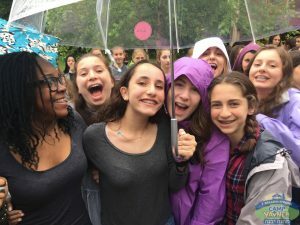 Luckily on Saturday the skies were clear and we spent the day singing, hanging out in the sun and enjoying the magic that is Shabbat at Machaneh Yavneh! Looking forward to an incredible first full week!